Nestled in the corner of Bay Lake lies one of Walt Disney World best resort properties…Wilderness Lodge. 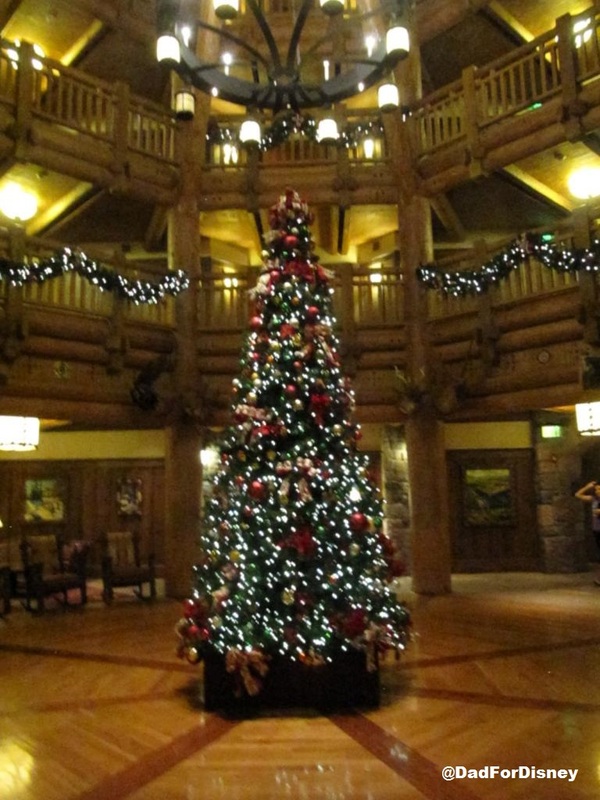 With it’s Pacific Northwest theme, it is also one of the best resorts to stay at or visit especially during Christmas time. It is warm, welcoming, and feels very open. The ceiling in the lobby is very high and there is plenty of seating for guests to just sit and relax while waiting for the rest of their party. 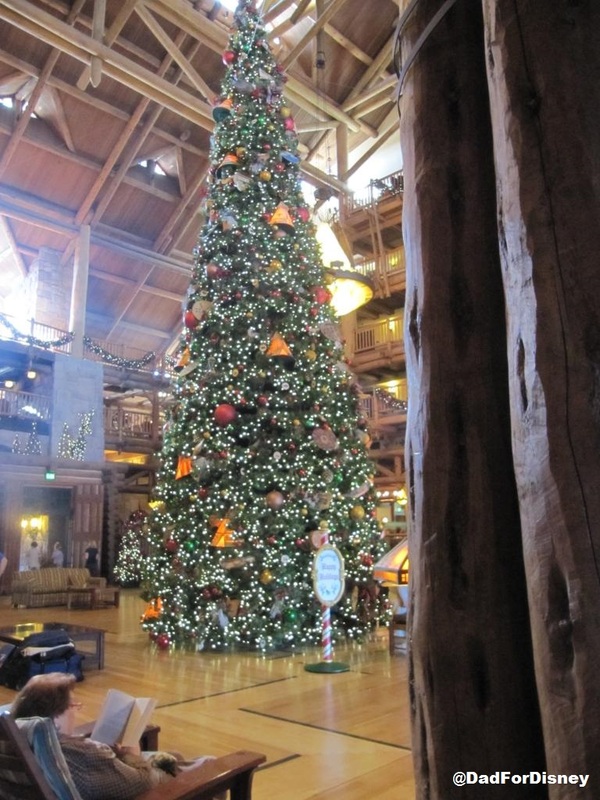 One of the nice things about Wilderness Lodge is it is a very compact resort. It’s not a long walk to anything. 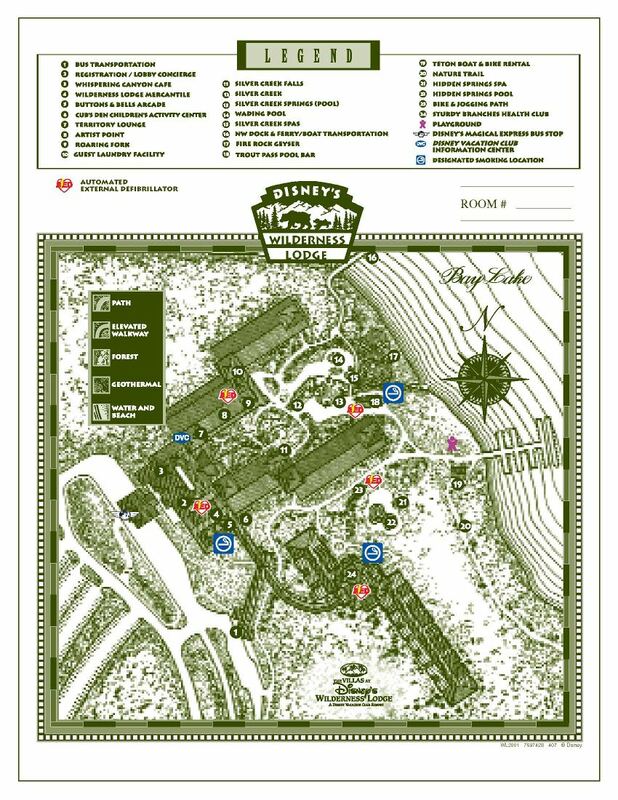 The longest walk that a guest could have is from the Villas back to the lobby or to the Roaring Forks Cafe. The lodge part of the resort is in five buildings in a U-shape around Silver Creek and the Silver Creek Springs Pool. The Villas are in a separate building from the main resort and have their own quiet Hidden Springs Pool. The Villas and the Hidden Springs Pool is a good three to five-minute walk away from the main building and pool which is enough to deter guests from the main building to come and use the Hidden Springs Pool. In the one villa stay I’ve had here, we never used the main pool. We just used the Hidden Springs Pool. It was hardly in use and a couple of the days we had the pool to ourselves. Let’s start in the lobby. The lobby is big and open has houses the check-in for both the standard rooms and the Villas on the right-hand side upon entering the building from the front. 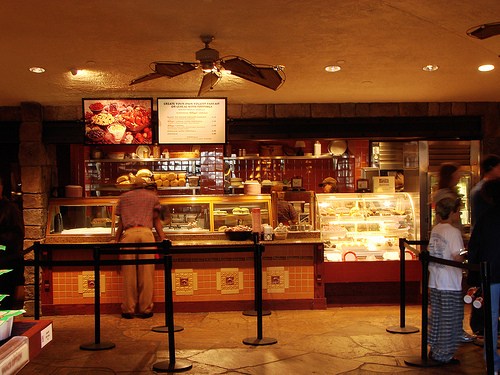 Whispering Canyon Cafe runs down the left-hand side. Past both of those areas is another vast sitting area including a bridge to cross the start of the Silver Creek. I’ve stayed in a Woods view room which faced the Magic Kingdom. We were lucky to have a high floor and if we looked through the trees we could watch the fireworks from our balcony. The most rooms come with two queen-sized beds. 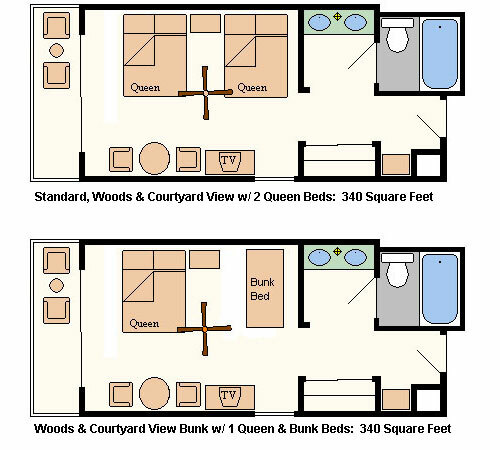 There are some rooms in the woods and courtyard view which have bunk beds. I stayed in a room with two queen beds. The rooms at 340 square feet are on the small side for a deluxe resort. But they don’t feel small, you have some space to move around and spend your time in the room walking over and into each other. 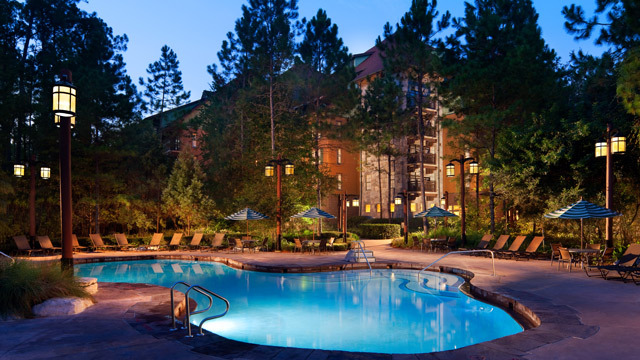 The pool is in the ideal location in the center of the resort. No room, minus the Villas, has a long walk to the pool. The pool, like all Disney pools, is heated to a comfortable 82 degrees. In early December and it’s cool outside, it doesn’t matter how warm the water is, you’re still cold getting out of the pool. When I was there in 2010, there was one or two warm days where the pool was busy. The other days, there were more ducks enjoying the pool than guests. Now, I’m not a big breakfast eater and my family prefers to save our snack/quick service credits for in the parks and not on breakfast so we never used our dining plan credits to grab breakfast from Roaring Forks. We usually grab a quick bite with groceries we have in the room. Now, we have eaten lunch and dinner there. They have a wonderful selection of sandwiches, burgers, and flatbreads. Dinner features much of the same as the lunch menu. The only drawback to Roaring Forks is the restaurant closes between 10 pm and midnight and is not a 24-hour restaurant. 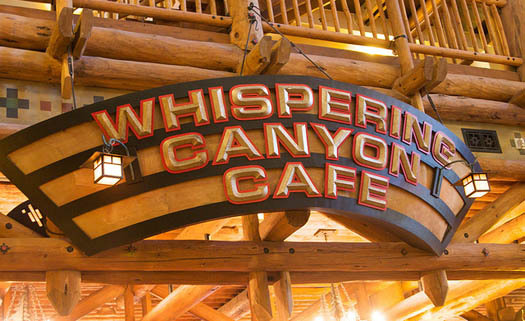 Whispering Canyon Cafe is the table service restaurant at Wilderness Lodge. 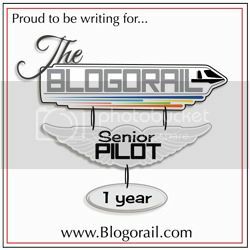 It is a fun experience. The food is excellent and the service can best described as unique. We have asked more to drink and gotten the giant glasses filled with the beverage of our choice. We have made sure to NOT ask for more ketchup. 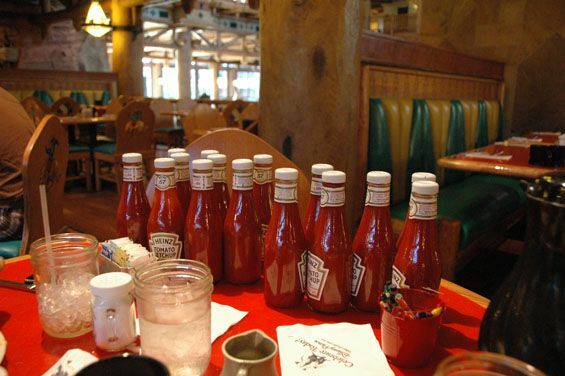 We don’t want to end up with a table full of ketchup. The seating area is quite large as it runs down most of the left-side of the lobby area. This provides space for the children’s horse races and other games that take place during a meal. 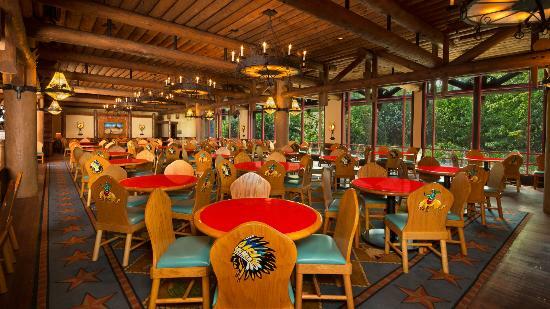 Lastly, we have Artist Point, one of Disney’s signature dining experiences. 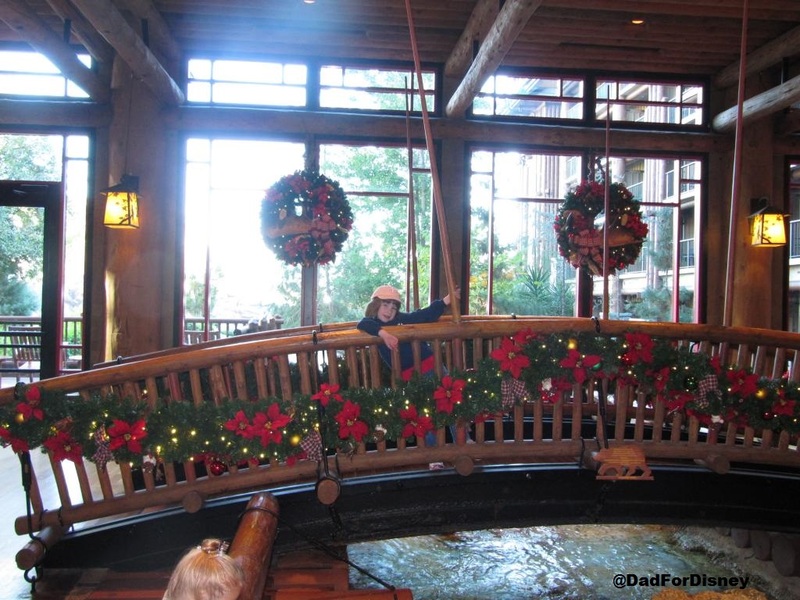 It is the one restaurant at Wilderness Lodge that we have not eaten at. The restaurant continues with the Pacific Northwest theme with its cuisine. The restaurant also has the same open feel that the rest of the resort has. This restaurant is on my family’s short list to eat at. It looks a bit more formal than Flying Fish Cafe which ate at last year. Maybe in a future visit when my daughter is a little older, we will take in the dining experience at Artist Point. 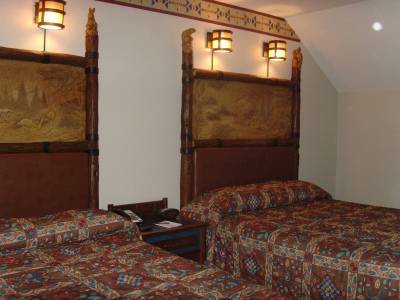 As a DVC member, I have also had the chance to stay in the Villas at Wilderness Lodge. The Villas are off in their own building/wing of the resort. 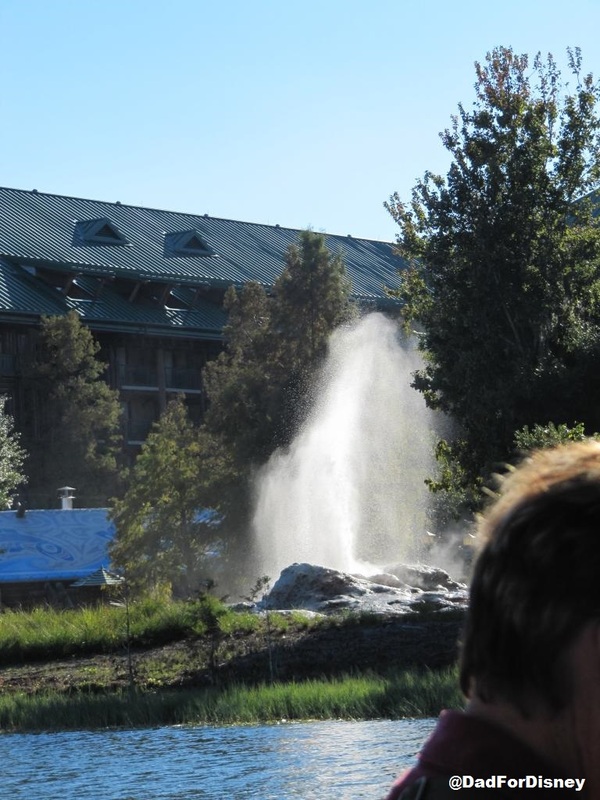 This wing is what creates the separation and the longer walking distances to the main resort. However, it is a shorter walk to the bus stop than for the guests from the main resort. The walk is short enough where a guest, if they walk fast enough, to go back and grab something from their villa and return to the stop before the bus arrives. There are no Grand Villas at the Villas at Wilderness Lodge. The largest villa is a two bedroom. 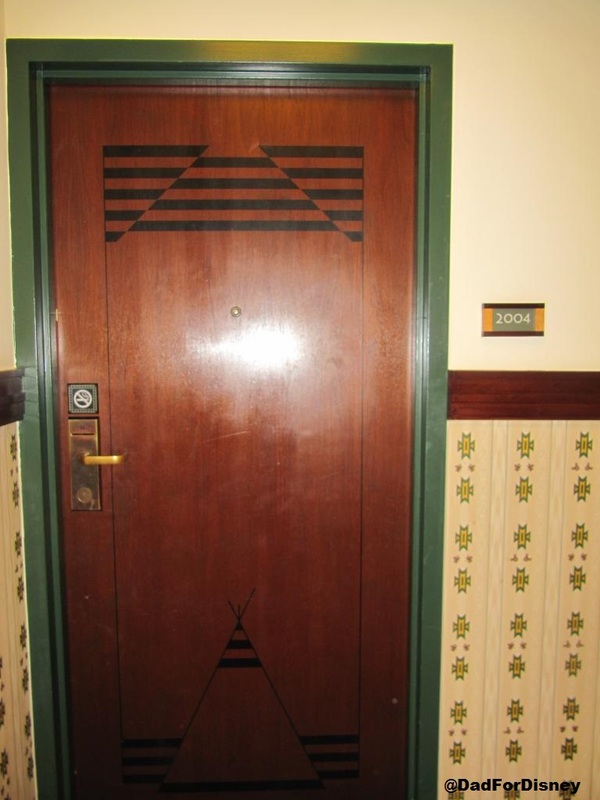 We, typically, stay in a one-bedroom which comes with a full kitchen and a washer/dryer. The one-bedroom has a very comfortable sleeper sofa. The Villas have their very own Hidden Springs Pool which is designated as a quiet pool. It is much smaller than the main Silver Creek Springs Pool. But for taking a quick dip to cool off and relax at the resort for an afternoon, it works. The main pool is couple minute walk from most of the villas. We didn’t use the pool much during our DVC stay since it was late November and we spent a lot of afternoons in the parks and not at the resorts. The lobby is also well themed. The buses are shared, at times, with Fort Wilderness and the Fort Wilderness Cabins. The boats are on a loop with Fort Wilderness. 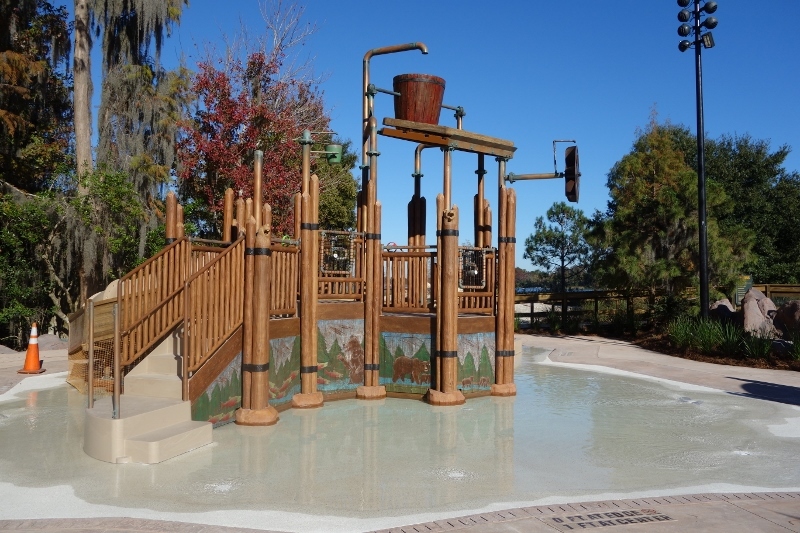 Hopefully, this guide helps you decide if Wilderness Lodge is right for you and your family’s vacation plans. 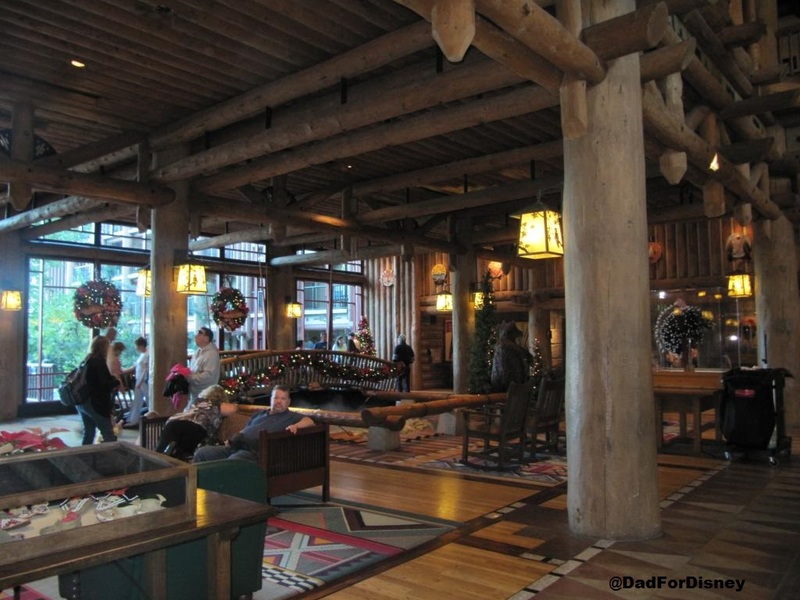 Wilderness Lodge is a nice entry-level deluxe resort. It is a short boat ride to the Magic Kingdom which is a fun to get to the parks and photographers can get some interesting shots of the Magic Kingdom as well as the other Bay Lake resorts from the center of Bay Lake.